The 125 ml PressureSyn reactors are certificated and rated to a maximum pressure of 100bar and temperature of 200C. The easy to open clamp mechanism also features a unique Safety Key designed by the chemists and engineers at Nottingham that does not allow the vessel cover to be removed without first releasing any residual pressure. Each Safety Key and vessel clamp are unique therefore ensuring that it cannot be undone with a spare key, only the Safety Key that is used to release any residual pressure of the reactor in use will open the clamp. Even with an operator opening the standard pressure relief valve in the correct manner it is possible to have a small blockage in a valve leading to some residual pressure. This required a safety design feature to be developed for the reactors to ensure that this was not possible; therefore each Safety Key valve assembly has a pin at its tip ensuring that when extracted will leave behind a small hole for any residual pressure to be released. Each individual reactor is tested to 170bar pressure, witnessed and certificated at this pressure by Zurich Insurance, giving our customers secure knowledge that this reactor when in use at its maximum it is actually under stressed. The standard safety features of PressureSyn comprise a double pressure relief system, including bursting disk and pressure relief valve. 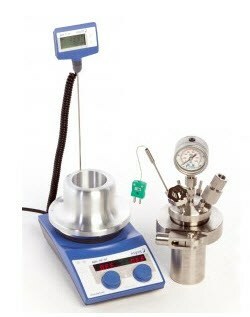 PressureSyn units are designed to work on any magnetic hotplate stirrer; a special DrySyn adapter plate allows the secure placement of the reactors on the hotplate stirrer; together with enhanced temperature transfer and the ability to control temperature from a standard hotplate stirrer’s temperature probe. Designed and engineered in the UK, from traceable certificated 316 stainless steel. Each reactor is hydrostatically tested and observed under pressure to 170 bar by Zurich Insurance. Comes with a pressure relief valve, and a bursting disk as standard. Unique bracket with locking clasp so the system can be easily set up and disassembled but cannot be disassembled when under pressure. Pressure relief needle valve with a built in key that can be used to unlock the clasp only once any residual pressure is released. Fits a specially designed DrySyn adapter base plate for use on a standard magnetic stirrer hotplate, to 200 degrees C.
Stirring is carried out via magnetic stirring bar. Gas inlet/outlet valve with compression fitting for attaching to steel pressure tubing. Additional (spare) 1/8th npt port for customers own attachments. Optional spares pack which comprises 5 additional o ring seals and compression fittings. Optional digital thermometer and extension cable. There are no threads in Asynt PressureSyn Reviews at this time.